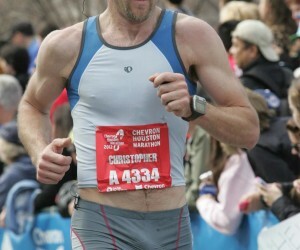 Dr. Christopher Segler a sports medicine podiatrist based in San Francisco ran the 2012 Chevron Houston Marathon. He says the course was fun, flat and fast. He covered the 26.2 mile course in 3 hours and 41 minutes. After the event he said that he had a great time and would highly recommend the Houston Marathon as a great race for marathon runners who want to run their first marathon, set a new PR or for those who might be coming back from an injury. You can read the full Houston Marathon Race Report here. Dr. Christopher Segler is a sports medicine podiatrist who has a podiatry practice in San Francisco focusing on runners and triathletes. He makes house calls for injured athletes in San Francisco, Marin and the East Bay. If you have a question about a running injury, you can reach him at 415-308-0833.